“Helps?” said the Inspector, rather stupidly. “Helps to find out if people are who they say they are,” said Miss Marple. This is a story in which several characters are not — or may not be — who they say they are. So when Miss Marple continues by asking the policeman, “Because that’s what’s worrying you, isn’t it?” she puts her finger on the precise problem. And Miss Marple’s conclusion: “But it’s not like that any more. Every village and small country place is full of people who’ve just come and settled there without any ties to bring them. The big houses have been sold, and the cottages have been converted and changed. And people just come — and all you know about them is what they say of themselves.” All you know about them is what they say of themselves — this is, in a nutshell, one of the core problems of modernity. In a sense, of course, there is nothing intrinsically, necessarily “modern” about this problem at all. Consider for example the famous case of Martin Guerre, who disappeared from his village in the Pyrenees in 1548. Eight years later a man showed up in the village claiming to be Martin and demanding his share of his now-dead father’s inheritance. Martin’s wife, Bertrande, agreed that this was her husband; he moved in; they had children together; life settled down — mostly: some in the village continued to deny that this was the man, and eventually a trial was held in Rieux to settle the question. When this did not satisfy all parties appeal was made to the court at Toulouse. In the midst of that hearing another man showed up and said that he was the long-lost Martin Guerre. After some discussion the family unanimously agreed that this newcomer was the real Martin and that the other man was an imposter after all. Eventually, Arnaud du Tilh — for that was the name of this man from a nearby village — admitted his crime and was hanged. The story, which has been retold over and over, in books and films and plays, was a sensation even at the time: a young Michel de Montaigne attended the trial, and learned treatises about the affair were published. How could a woman not know whether a man was her husband? How could Bertrande be wrong about such a thing? Was she just lonely and overworked and happy to accept the stranger’s story, since it meant the resumption of something like a normal life for her? When she was eventually convinced by relatives to claim that the new man was an imposter, why did she agree? Had something happened to change her mind? The interest has focused on Bertrande, because she would have had the most intimate knowledge of her husband, including knowledge of his body, and the body’s testimony to personal identity was the only testimony, in that time and place, that could have added substantively to the evidence. All that anyone else knew about “Martin Guerre” was, as Miss Marple might put it, what he said of himself; Bertrande could know more than that. And yet she still affirmed, for years, that Arnaud du Tilh was Martin Guerre. One other element of the story is significant. That Arnaud lived in a nearby village was what enabled him to gather sufficient information about Guerre to be able to impersonate him successfully: he could answer most of the questions friends and family might ask in order to confirm his identity. Yet it seems that no one ever wandered over from that village and said, “Say, aren’t you Arnaud du Tilh?” This tells us something about the insularity of those Pyrenean villages, in something close to the etymological sense of the word: they must have been little social islands. For Miss Marple such insularity is precisely what prevents the problem of identity from arising: “If anybody new — really new — really a stranger — came, well, they stuck out — everybody wondered about them and didn’t rest till they found out.” So it was with the apparent return of Martin Guerre, a return which could only become socially problematic in a social world sufficiently small and stable that even minor differences in appearance or mannerism could become subjects of general contemplation. For Miss Marple such smallness and stability is deeply reassuring. She associates this integral, harmonious society in which everyone knows everyone else with her youth — but then, people always do. Raymond Williams begins the bravura second chapter of his great book The Country and the City (1973) by noting that a “few years ago” — perhaps not long after Christie published A Murder Is Announced — he had read a book that made a strong claim: “A way of life that has come down to us from the days of Virgil has suddenly ended.” Suddenly! But then Williams remembered another book that had made almost the same claim — in the early 1930s: the ruin had come with, or soon after, the Great War. But (Williams discovered) people writing around the turn of the twentieth century believed that it had all fallen apart a few decades earlier. And so back we go: the “organic community of Old England” is always just out of sight, just on the other side of that hill. Williams walks the familiar line of argument all the way back to the Middle Ages. It seems almost universal for us to associate stability with our childhood, or a period preceding it, as though the world did not change until we ourselves did, perhaps in adolescence. What the great seventeenth-century mystic Thomas Traherne said of his child’s-eye view of the fields surrounding his home — “The corn was orient and immortal wheat, which never should be reaped, nor was ever sown. I thought it had stood from everlasting to everlasting” — may be a commonplace experience. 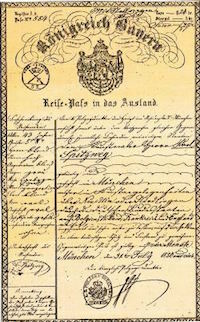 Nineteenth-century passports, like the one pictured above (Kingdom of Bavaria, 1851), were used primarily for diplomatic purposes. Wikimedia Commons Significantly, British passports were generally written in French rather than English until the 1850s, a practice usually said to reflect the dominance of French as the diplomatic language of Europe and the fact that, for most of the previous three hundred years, diplomats were the people most in need of passports: it was necessary for government servants from different countries to be able to authenticate one another’s identities. There was no perceived need for documentation of identity within a country: the assumption was most people stayed where they came from, and were who they said they were. And this was a reasonable assumption: after all, the story of Martin Guerre became so famous because it was distinctive. It was the exception that proved Miss Marple’s rule about orderly, stable village society. But in the international sphere, France, in addition to providing the language of diplomacy, was among the strictest European nations in requiring foreigners to present passports before being allowed within the country’s borders — especially during the revolutionary years, and then again following the fall of Napoleon and the restoration of the monarchy. Moreover, in its anxiety to keep track of any persons who might disturb its stability, the Bourbon government mandated that all inns keep detailed records of guests, which typically meant that foreigners would need to present passports to innkeepers as well. The [British] passport provided the name of the bearer but did not describe the bearer or have a space for the bearer’s signature. More than one person could be covered by a single passport. Reflecting the aristocratic notion of deference to persons with social status, servants and family members (often described only as such) were usually included on the passport of a single (generally adult male) individual. While the date the passport was issued was given, no time limit was stated. Passports did not indicate whether the bearer was a British subject. wished to see the system abolished altogether, and that the English nation would set the example to the rest of Europe, by declaring she would grant no more passports. England should proclaim the non-necessity of them, and declare that every man who travelled did so under the safeguard of the law, and that wherever he went, as a subject of England, the power of the law protected him, so that he consequently required no passport. They were not necessary, for the rogue and the evil-designed could ever have one. These warnings and dissents were not, however, heeded: in 1858, the modern British passport was created. Many government officials had long argued that this was necessary for full participation in modern Europe, but the desired changes were ultimately brought about in a strange way. In January 1858, an Italian nationalist named Felice Orsini attempted to assassinate the French Emperor Louis-Napoléon as he and the Empress were on their way to the opera. The three bombs Orsini threw at the carriage went off, and eight people were killed — but the Emperor and Empress remained unhurt. Orsini was arrested the next day, and it was eventually learned that he had entered France using a Foreign Office passport issued to an English barrister named Thomas Allsop — following the standard British practice of lumping several persons under a single passport. Allsop had even helped Orsini acquire the materials from which he made the bombs. The Orsini affair did not only affect British citizens traveling abroad. 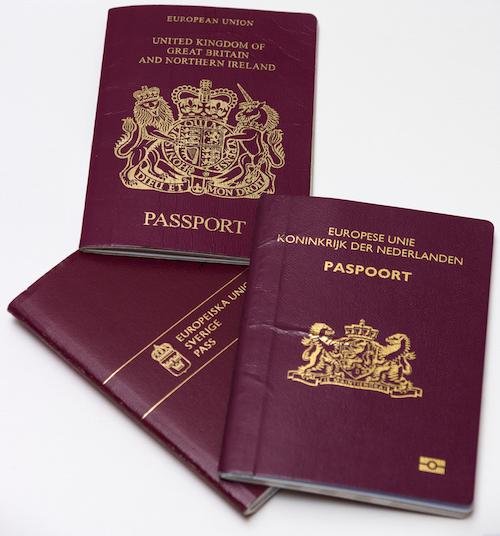 On the contrary, Anderson notes that, following the reforms of 1858, “the British passport was ... transformed into a national document of individual identity for all Britons.” By these means, Great Britain, which was and would remain for decades the most powerful and influential nation in the world, contributed significantly to the standardization of identity documents. The British passport was so “transformed” because it met, or seemed to meet, a need never mentioned in the debates over what the French and other European nations demanded. We may call it the Miss Marple problem: Setting aside foreigners, who always and instantly raise suspicions when they turn up in charming little villages like Chipping Cleghorn, how do you know that your neighbors are who they say they are? In their introduction to a collection of essays extending the work of Raymond Williams, The Country and the City Revisited: England and the Politics of Culture, 1550–1850, Gerald MacLean, Donna Landry, and Joseph P. Ward note that “during the sixteenth century, most men and women worked in the agrarian sector and lived in the countryside, while fewer than five percent of them lived in towns. By the middle of the nineteenth century that had changed so dramatically that towns with more than 10,000 inhabitants together comprised roughly half the population of England.” And of course that trend has only continued, in England and elsewhere in the world, in the decades since. Such a trend means that places like Chipping Cleghorn will inevitably decline in population, affected as their people are by the gravitational pull of the great metropolises; but the resulting circulation of persons created will bring the occasional stranger into the village’s small orbit. The arrival of an Arnaud du Tilh, under his own name or some other, will be a regular, not an exceptional, occurrence. And what do the long-term residents do about that? In A Murder Is Announced, Miss Marple comments that in the modern world, “People take you at your own valuation. They don’t wait to call until they’ve had a letter from a friend saying that the So-and-So’s are delightful people and she’s known them all their lives.” Why would anyone take an unknown woman at her “own valuation”? Surely this can only be because she dresses and speaks and acts in ways that reinforce the social standing to which she lays claim. If people look respectable, then we may with some safety assume that they are respectable. But is that sufficient? Often it is, and often it is because we assume that their identities will have been registered and confirmed by the official agencies of the state responsible for such matters. that ... was exactly what was oppressing him. He didn’t know. There were just faces and personalities and they were backed up by ration books and identity cards — nice neat identity cards with numbers on them, without photographs or fingerprints. Anybody who took the trouble could have a suitable identity card — and partly because of that, the subtler links that had held together English social rural life had fallen apart. In a town nobody expected to know his neighbour. In the country now nobody knew his neighbour either, though possibly he still thought he did. The Victorian MP John Arthur Roebuck’s claim that “the rogue and the evil-designed” could easily obtain passports proves to be important and troubling: if so, then all that passports (and other identity documents) can achieve is a false sense of security. In A Murder Is Announced, half a dozen characters turn out to be displaying quite false identities to the world. One of the few who isn’t altogether other than she appears is the cook Mitzi — referred to by the other characters as a “Mittel European,” which is Christie’s euphemism for “Jew” — and yet Mitzi is frequently referred to as a pathological liar. The deepest deceptions are perpetrated by the English, though; importantly, these are all aided by the dislocations of the recent war, in which several of them played a part. 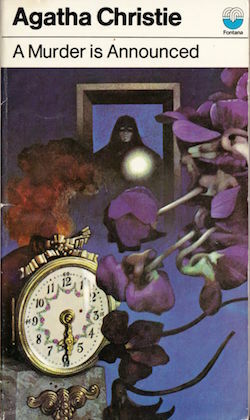 It should be noted that those “subtler links” had a dark side that Miss Marple doesn’t acknowledge: they provided means by which elite members of society could police their boundaries, to make sure that no stranger — no one with the wrong “blood” or the wrong background — could falsely claim a place within the charmed circle. The Miss Marples of the world need to know not just “who it was that Lady Somebody’s daughter married” but also who is properly eligible to marry Lady Somebody’s daughter. Only if we know who people really are can we know whom to shun. What makes Miss Marple distinctively insightful, and useful to the police, is her ability to transfer her minute observations of “the subtler links” that once held society together to a context in which those links have broken. The same small traits of speech and action that once would have instructed her in social belonging now enable her to discern social displacement. The same attentiveness that enabled her to interpret a social photograph now enables her to interpret its negative. The police can consult their records, can obtain files from their counterparts in Switzerland, but as servants of an administrative and bureaucratic regime they have no training in or understanding of the social cues Miss Marple has mastered. But, one might argue, Miss Marple’s local knowledge and sensitivity to social subtleties are required only because the reigning technologies of identity are so primitive. When Inspector Craddock laments the weak evidence provided by “nice neat identity cards with numbers on them, without photographs or fingerprints,” he is implicitly longing for better tech. Well, now we have it. Leo Benedictus notes that “The [current] Nicaraguan passport, for instance, boasts 89 separate security features, including ‘bidimensional barcodes,’ holograms and watermarks, and is reputed to be one of the least forgeable documents in the world.” For about a decade, the United States has been issuing passports with RFID chips capable of storing digital information; these chips have the capability (as yet unused) to store biometric information like fingerprint and eye scans. Other countries have already implemented biometric passports; for instance, all Swiss passports issued since 2010 have carried a chip with images of two of the bearer’s fingerprints. And the Unique Identification Authority of India is overseeing the largest project of this kind yet known, attempting — pending approval from the nation’s supreme court and parliament, which is not assured — to collect demographic and biometric data for every person in India and then assign to each person a twelve-digit identity number. Amidst all these governmental projects, the forging of identities continues apace, regularly matching the improvements in official documents. In 2014, the artist Curtis Wallen wrote an article for The Atlantic describing how he created a wholly fictitious person named Aaron Brown, equipping Aaron with all the necessary identity documents and even with social media accounts. For Wallen, this was in part an art project and in part an exploration of the possibility of achieving true privacy in an online world, but it is also indicative of what some call the fungibility of identity in an online world — which is to say, a world in which our identities are always mediated by digital technologies, technologies that can be used for any imaginable purpose. But if these technologies are so powerful, and cannot be reserved by the world’s governments for their own use, then we are back to Miss Marple’s problem: how to “find out if people are who they say they are.” In this light, it’s worth noting that a country with a particularly strict need to discern the identities and intentions of visitors, Israel, relies less on identity-document technology than on simple profiling — where are you coming from, what is the ethnicity of your name, what do you look like — and agents carefully trained to discern behavioral eccentricities. Getting through customs at Ben-Gurion Airport is like navigating a whole room full of Miss Marples. This can be a slow and, if you’re singled out for further screening, excruciating process. But the discerning of strangers’ identities, when taken seriously, has always been slow: the passport rules established in the mid-nineteenth century were often neglected in the succeeding fifty years, likely because they were so tiresome to everyone concerned. However, with the increase in political tensions in the first years of the twentieth century — the same tensions that produced two world wars — passport rules began to be implemented more consistently in Western countries. But if anything has reliably increased in the past two hundred years, it is impatience with delays. For this reason, researchers, in Israel and elsewhere, have been trying to develop technological replacements for the kind of close observation that Miss Marple and the Israeli customs agents do: various forms of biometric analysis — Do your heartrate and respiration speed up when you’re asked pointed questions? — that will be, so researchers hope, more “objective” than the responses of human agents. Presumably Inspector Craddock would be pleased. According to this understanding, personal identity is summed up in one’s name, and one’s name is the joint gift of parents and church. The state has nothing to do with it. Therefore historians who want to know more about the demographics of any given (European) region in the distant past often rely on parish records — baptisms, weddings, funerals — since governmental records are typically scarce or nonexistent. It is not easy to see — though I think it is necessary to see — how many of the technologies of modernity, from filing systems to postal systems, from photography to fingerprint analysis, have arisen in the service of making us “legible” to the state. We are all legible people now, and most of us see no alternative; thus the quests by so many to have their own sense of identity — who or what they “identify as” — be officially recognized by the state. If the state cannot read us — “legible” is from the Latin legere, “to read” — do we exist at all? 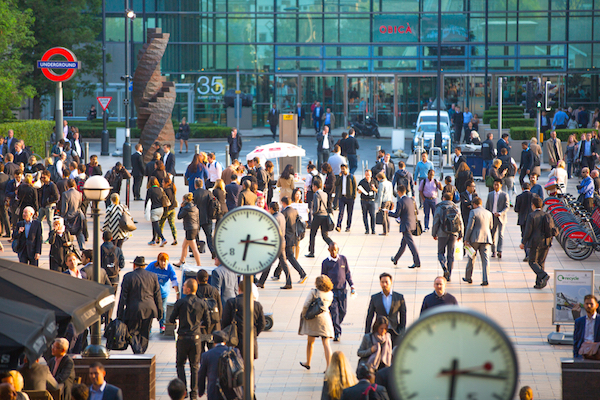 Life among strangers: a busy plaza in present-day London. Further, the state’s distinctive ways of reading us are easily extended to private organizations, and especially commercial enterprises: consider how many financial transactions require the provision of one’s Social Security number as a means of establishing unique identity in ways that mere names cannot. * The larger the enterprise, the more its ways of seeing resemble those of governing bodies — and the closer it works with those bodies, though sometimes not close enough to suit governmental agencies, who demand “back doors” into customer data gathered by private companies. Thus Facebook, the largest social media company in the world, today demands that its users employ their “authentic identity,” as confirmed by a government-issued ID or by forms of nongovernmental ID that are themselves usually only obtainable with a government-issued ID. Facebook is trying to link its users’ identities as closely as possible with the ratification provided by the state. Even Miss Marple puts her exceptional acuity in the service of this state-sponsored model of identity: she offers her local, personal, intuitive knowledge to supplement the deficiencies of police work, to fill in the gaps in official documentation, to bring people’s self-proclamations into line with governmental records. To “find out if people are who they say they are” is to set self-description against what the state sees, what the state reads. [*] Names are not the only relevant category here, and numbers mark the perfecting of legibility. In one of the most disturbingly surreal moments in Art Spiegelman’s Maus, Spiegelman’s father recalls a fellow prisoner who approached the guards and insisted that he was not a “Yid” or “Polack” but a real German. In the iconography of this graphic narrative, the Germans are cats and the Jews are mice; and Spiegelman depicts this man as a mouse. In one panel, we see him with a shadow of a cat’s face, as though to acknowledge the possibility that what he says is correct; but as Spiegelman’s father says, “For the Germans this guy was Jewish.” And the illustration confirms the Reich’s power to make that determination, a power that is most perfectly seen in the erasure of prisoners’ names and their replacement by branded numbers. Alan Jacobs, a New Atlantis contributing editor and the author of the Text Patterns blog, is a distinguished professor of the humanities in the honors program of Baylor University. He is the author, most recently, of The “Book of Common Prayer”: A Biography (Princeton, 2013). Alan Jacobs, "Miss Marple and the Problem of Modern Identity," The New Atlantis, Number 47, Fall 2015, pp. 18–30.